Australian saddle design insures perfect posture even when you lean forward to work. 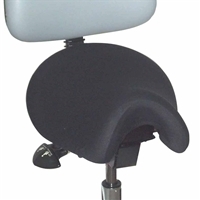 Anatomical seat contour stabilizes the pelvis for effortless postural control. Sizes for adults and children. A Bambach Saddle Seat made especially for dental professionals. Relieves pain, reduces fatigue, corrects posture, increases mobility, and improves circulation. Australian saddle design insures perfect posture even when you lean forward to work. 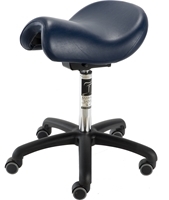 Anatomical seat contour stabilizes the pelvis for effortless postural control. With backrest. Sizes for adults and children. Attaches to dental and surgical saddle stools to support the body and arm for precision work. Recommended for surgeons, dental assistants, and sonographers. Compatible with the Bambach Saddle Seat, Salli Saddle Chair, Brewer Saddle Stools, and others. Foot platform accessory adapts the Bambach Saddle Seat for small children and for special needs. 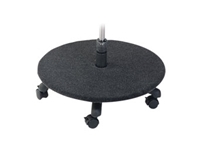 Carpeted plyboard base supports the feet and increases safety for those with reduced leg coordination. Medical quality sheepskin adds softness and breathability for your Bambach Saddle Seat. Washable cotton T-shirt knit adds affordable protection for your Bambach Saddle Seat. Protective covers slip on easily. The same cover can be used to cover the seat or the medium backrest. Explore the origins of back trouble caused by poor sitting posture, and how the problem can be alleviated by saddle-sitting. 30 pages. Genuine Bambach Saddle Stool pneumatic chair cylinders.